Reading to Kids is excited to celebrate our 15th birthday at the "Fantasy, Folklore, and Fairy Tales" Reading Clubs on May 10th! Earlier this month we gave away our 125,000th book to a child and our 25,000th book to parents & teachers! Help us give away even more books by signing up for May 10th. 15TH ANNIVERSARY COMEDY NIGHT & SILENT AUCTION WITH LAMB CHOP "AFTER DARK"! Our 15th Anniversary Celebration, Comedy Night & Silent Auction is just 5 days away on Tuesday, April 29th! Help us celebrate our quinceañera and join us at the Hollywood Improv for what promises to be a side-splitting show featuring comedian and actor Fred Stoller! You may recognize Fred from Everybody Loves Raymond, Seinfeld, Happily Divorced, the voice of Stanley in the Open Season franchise, & many other TV shows and movies! Joining Fred we'll also have Jason Collings and Matt Kirshen, with more hilarious comedians hand-picked by the world famous Hollywood Improv! Tickets are just $20 with appetizers and dinner available for additional purchase from the new Roadhouse LA at the Improv's showroom menu! Our evening will be hosted by Mallory Lewis and Lamb Chop "After Dark"! See the puppet you grew up watching as she helps us celebrate 15 years of Reading to Kids! We are also very excited to announce that our celebration is presented by one of our long-time supporters, DOMA Theatre Company! 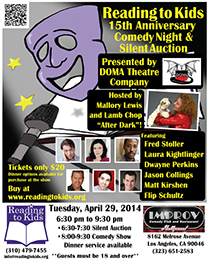 "DOMA Theatre Company is proud to be the Title Sponsor for this year's Reading to Kids Comedy Night and Silent Auction. 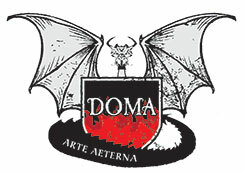 As a non-profit theatre organization dedicated to the preservation of musical theatre and the arts, DOMA Theatre Company recognizes the importance literacy plays in preserving, creating, promoting and augmenting the arts. By participating in reading programs, students strengthen the future of the arts for generations to come." We extend our sincere thanks for their sponsorship and support and look forward to celebrating with them this Tuesday! Please also print out the above flyer and post it wherever many people are likely to see it. Our Comedy Night makes a great night out with friends and co-workers! - Certificate for 4 VIP tickets to a live taping of "Conan" on TBS, starring Conan O'Brien! - Tickets to Clippers and Kings games, your favorite So. Cal. amusement parks, theaters, and fine restaurants, including two Disneyland Park Hopper tickets! We still have yet more items to post over the next few days, so check out the fantastic deals, buy your Comedy Night tickets today, and get ready to win! Thanks, and we'll see you this Tuesday at Comedy Night! 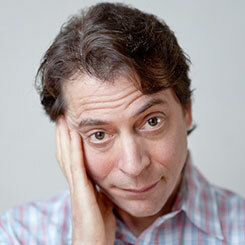 - 15th Anniversary Comedy Night this Tuesday - New Talent Added!